Everyone can now be pretty with quality nail lacquer. Colour of the nail polish you see here might defer slightly from the actual product due to computer resolution or lighting during photography. Each ORLY shade is DBP-free and features the award-winning Gripper Cap.™ 18ml per bottle. 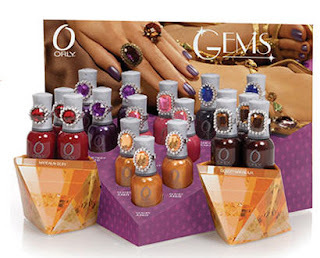 Inspired by famous gems from around the world, this rich array of jewel-toned shades will dazzle on your shelf and clients' nails! Each lacquer comes with a FREE costume ring with coordinating gem.